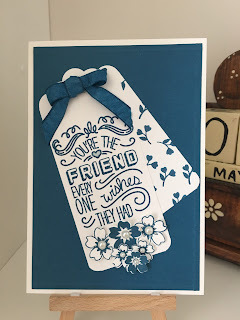 This month's stamp set of choice is the fabulous Friendly Wishes. For my project I chose to create a monochrome card using my favourite, brand new in-colour Dapper Denim.....just look at that ribbon, isn't it gorgeous!!! I also used the Bloomin' Love stamp set and matching dies for the flowers and the tag topper punch. Dapper Denim and the other four beautiful brand new in-colours, along with a host of fab new stamps and dies will be available to order from the 1st June 2016. If you would like to get your hands on the new catalogue, just fill your details on the 'request a catalogue' page or give me a call and I'll happily pop one in the post for you. Thanks for stopping by today, please don't forget to pop by again next Thursday for my next project in the Pootler's Design Team Challenge.